Posted July 8, 2006 in 2006/07, 4 DC (early), Harvey Covers, Periods, Serial Posts, Topic, z Archive. 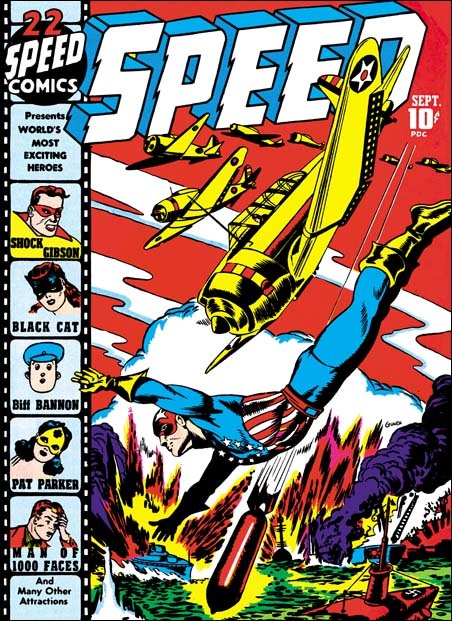 There were three Harvey comics from the same period as the Jon Henri covers that I did not include in my last chapter; Champ #22 (September 1942), Speed #22 (September) and Green Hornet #8 (August). To me they always seemed to be very different and previously I did not consider them as done by Simon and Kirby. However Speed #22 is included in the Jack Kirby Checklist and I understand that recently some have attributed Champ #22 to Joe Simon. I still say these three covers are stylistically distinct from the Jon Henri covers, but I now realize I erred in not believing them as work by Joe Simon. In a footnote to chapter 2, I mentioned providing to Joe Simon copies of my restoration of two stories from Daring Mystery #2 (February 1940). One was signed as Gregory Sykes and Joe revealed that in high school he and his friends sometimes used another name and his was Gregory G. Sykes. But the conversation did not end there. Joe also said that as a comic book artist he thought he had used three pseudonyms. He knew two of them (Jon Henri and Gregory Sykes) but could not recall the third so he felt he might have been mistaken. As Joe did not remember these Daring Mystery stories at all, he began to read them with much interest. 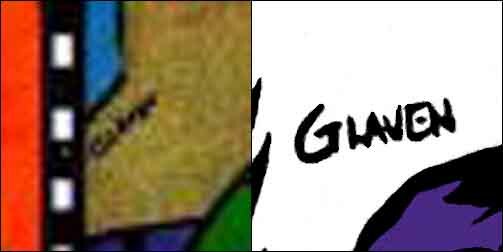 At one point Joe stopped and chuckled, he said that in the Phantom Bullet story he had used the name Nelson Glaven for one of the characters. Nelson Glaven was the alternate name for Ned Gibman, one of his high school friends. I did not say anything, but I immediately recognized the name Glaven. Speed #22 is a great cover. The planes diving out of formation leading to a similarly diving Captain Freedom and then to a bomb is very effective. This sort of formal device and the more static layout it provides is not the sort of thing usually found in covers by Simon and Kirby. But Joe did experiment with different compositions from time to time and this apparently is an example of that. This cover is so different from other work by Simon that I cannot provide any drawing features to link this particular cover to Joe. However the inking is done with a brush in a manner very much like the inking of some of the Jon Henri covers, particularly the form lines on the airplanes and the boots. Unfortunately I do not have scans for the covers of Champ #22 or Green Hornet #8. The Grand Comic Book Database (GCD) does have scans but I do not think it would be good web etiquette for me to link to the images directly so let me provide a link to the GCD. It might be easier to follow what I say if you open up some new windows and use them to get the images for Champ #22 and Green Hornet #8. Don’t worry, I’ll wait for you to get back. Unfortunately the GCD scan is has too low a resolution to clearly read it. I provide a blowup of the GCD scan and one from Speed #22 for comparison. I think Champ #22 may also been signed Glaven but it is hard to be sure. This issue is unique among the Champ covers we have examined in that the Human Meteor has replaced the Liberty Lads. The cover has the appearance of being constructed from a number of different swipes. The hooded foe in the lower right corner came from Lou Fine’s Wonderworld #7 cover. I do not have my own scan of that cover, but Comicartville does. The lady being thrown into the pool seems unnatural. Her hair and general pose looks more like she is lying down rather then falling. I am sure she was taken from someplace. I cannot identify other swipes but that is not to say there were not any. The Human Meteor and his young sidekick both have large ears that are not quite placed on the head correctly. This unusual treatment of ears viewed from the back is also a characteristic of Jack Kirby at this time. But the anatomy and pose of the Human Meteor just does not otherwise look like Jack’s work. I am not bothered by Joe’s use of swipes, what is important is the story the cover tells. Unlike most of Joe’s covers, I am not at all clear what is supposed to be going on here. Is the Human Meteor attacking the hooded villains or trying to catch the falling woman? What type of sling-shot does the sidekick have and what is he doing with it? Have the heroes interrupted some evil ritual or did the villain push the woman into the pool as a response to the sudden appearance of the Human Meteor? It is this failure to clearly tell the story that for me makes this one of the Joe Simon’s poorer efforts. Is the cover to Green Hornet #8 (August 1942) also by Joe? The two villains on the right are crudely done, but their cheeks and jowls remind me of the of the members of the circle on Speed #21 (except for the clown) which I have already attributed to Simon. Once again there seems to be signs of swiping. Although I cannot provide any source, the damsel in distress looks an awful lot like she was originally done by Will Eisner. Although not among my favorite Simon covers, it is an improvement over Champ #22. Here is a story that can be easily read. A crystal ball predicts a dim future for the chained woman. A fiendish pair was advancing with drawn daggers to insure the prediction would come true. That is until they were interrupted by our hero. The Green Hornet will save the day, assuming he is careful where he takes his next step. I like the touches of humor. The fiends arrive holding hands with the smaller one carrying his knife in his mouth. The cobwebs show up not only on the walls and floors, but also connects the robed figure to his staff. I guess my biggest problem with this cover is not that he swiped the figure of the woman, but that it appears that Joe changed her so little. Simon and Kirby would do the last of these Harvey cover in October (Green Hornet #9). I do not accept Green Hornet #10 as a Simon and Kirby piece. Perhaps they became too busy to do any more. S&K were very successful at DC but with the war on they knew that sooner or later they would be drafted. Joe’s solo work during this war time period will be discussed in the next chapter.